My local Boots finally had Models Own Ibiza Mix in stock! Yay! There was a buy one get one half price deal on all Models Own makeup so I picked up a second HedKandi polish. I went for the shade Hedonist. As with all Models Own polishes, these are fab quality and Hedonist was opaque in one coat. Hedonist has a matte finish which I'm not used to but it didn't matter since I was adding Ibiza Mix as a top coat. Hedonist is a beautiful red-orange colour. My camera is picking up more of the orange but I'd definitely say it's more red than orange. I love how Ibiza Mix has small and large foil pieces in various shades of blue, gold and baby pink. It's very pretty. Next time I use it, I think I will try it alone but build up several layers. What nail polishes have you been wearing lately? 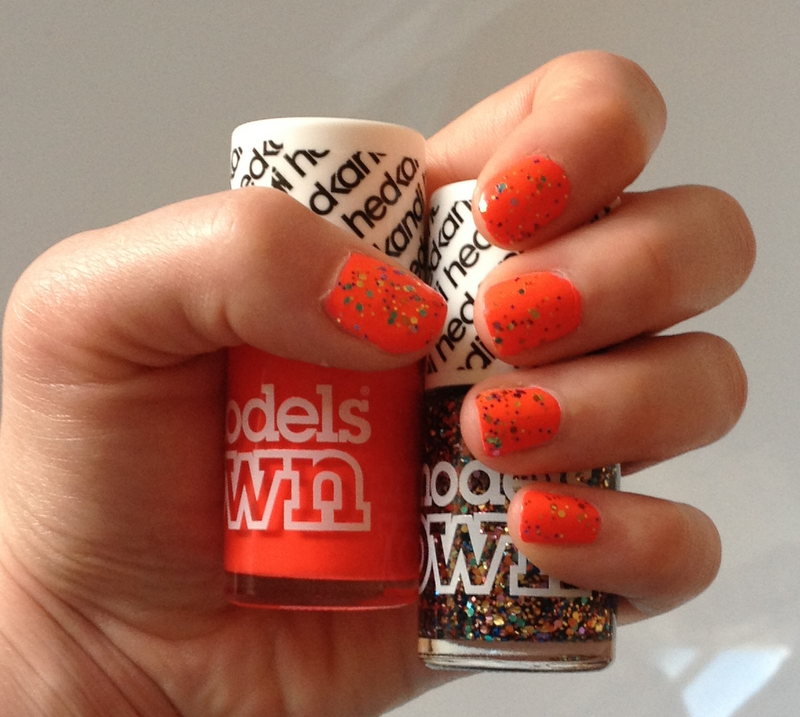 Model's Own Hedonist is actually my favourite Model's Own polish! I'm in love with the Hedkandi collection and have even reviewed them on my blog :)! ibiza mix is beautiful. love it! I want Ibiza Mix so bad! It's lovely! Aww it's a shame when certain products aren't really available in your country isn't it :( Wish you could buy all products everywhere! This post has confirmed for me that I need orange nail polish! Lovely post and great blog! I found you through the BBU blog hop :) have started following!